Creative thinking: John Nottingham (left) and John Spirk. A low-cost spinning toothbrush. A plastic paint can with a spout. A kids’ tricycle with a built-in squirt gun. 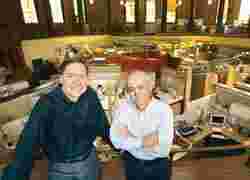 Each started as an idea at a company run by two former college buddies and now operating out of a 76-year-old converted church. Nottingham-Spirk Design Associates has sold its ideas to a variety of companies, including Newell Rubbermaid, Little Tikes, Huffy, Invacare Corp., Procter & Gamble Co. and Black and Decker. Product designs emerge from brainstorming sessions in which designers try to make keen observations about ordinary things. “What we have found is that by being outside of the bureaucracy of the average corporation, we’re free to do anything we want," the tall, thin, often-smiling co-chief executive officer (CEO) John Nottingham said. “If we come up with something, then we’ll show it to a company, and if it is interested, then we can make a deal." Nottingham-Spirk, with about 70 employees, also designed the Swiffer SweeperVac, which has become a well-known product for Procter & Gamble; a swivel Christmas tree stand; easier to hold hand tools; and a spinning brush for washing dishes. Three years ago, Nottingham-Spirk spent $15 million to buy and remodel the former First Christ Scientist Church, built in 1931. The design firm had been in a factory building and a large house before consolidating in the church. A large pipe organ that came with the church is played occasionally (helped by a computer) for visitors to the redesigned building, which the company calls the Nottingham-Spirk Innovation Center. The church pews have been replaced by work stations. There’s a colourful domed ceiling inside the former sanctuary, but no stained glass windows or any other religious symbol. Former Sunday school classrooms now hold tools and machines to form and mould metals and plastics, where designers’ ideas can be turned into prototypes. The goal of staff brainstorming is a “wow" idea. Designers listen to an idea presentation and vote one of three ways: wow, that’s nice or who cares? Even an idea that doesn’t dazzle at first has value, co-CEO John Spirk said. “Sometimes the timing isn’t right, or we’re looking for another piece," he said. “We’re constantly referring to things we put on the shelf maybe 10 or 15 years ago. We’re not trying to solve all the problems of the world, at least not right away." The two CEOs became friends in the early 1970s at the Cleveland Institute of Art. Now they and their staff draw ideas from real-life observations, often from the products they see on display at stores such as Wal-Mart and Target. Nottingham-Spirk has obtained nearly 500 commercialized patents since its founding in 1972. One designer is now working on an electric kitchen knife, but what makes it different from any other is a top secret. Others are trying to come up with a new kind of pumpkin carving tool, or a snazzy new kind of skateboard. Another’s project is a juice chiller for a desktop or shelf. One lab is working on innovations for the door of a sports utility vehicle. In partnership with the New York-based Innovation Fund, Nottingham-Spirk is developing “flavour tops" that can fit onto ordinary water bottles and hold concentrated powders to flavour the water or add a medicine. “It’s a high-energy atmosphere," said Saunders, a Nottingham-Spirk designer for 25 years.